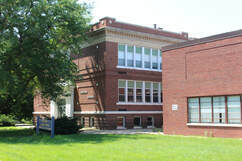 Thanks to a generous donation by Rick & Doris Kennay, VCCT has acquired the old Lincoln School building in Rochelle. We have already begun the long and expensive process of converting in to our new home! This entails bringing it up to code, installing bathrooms, putting in heating and air conditioning, and remodeling the old gymnasium into a beautiful theater! We can't do this alone. Your generous donation will help us make our dream theater come to life! Jerry & Annette Johns have offered to match every dollar we raise during the months of March and April, up to $25,000! This means your $100 donation becomes $200, and your $1000 donation becomes $2000. If you've been thinking about making your tax-deductible donation, now is the time to do it! * The list of products shown represents the type of items we will need to purchase in order to remodel the building. Your donation will go into the capital building fund that will be used exclusively for building-related expenses. Even though you choose an item, you are actually making a donation and will not receive any actual products in exchange for your donation. All donations are tax deductible.